Mac Barnett is the author of three books illustrated by Jon Klassen: Extra Yarn, which won a Caldecott Honor and a Boston Globe–Horn Book Award; Sam and Dave Dig a Hole, which won a Caldecott Honor and an E. B. White Award; and Triangle. With Jory John, he is the co-author of the New York Times best-selling series The Terrible Two. Mac Barnett lives in California. Jon Klassen is the author-illustrator of I Want My Hat Back, a Theodor Seuss Geisel Honor Book; This Is Not My Hat, winner of the Caldecott Medal and the Kate Greenaway Medal; and We Found a Hat. He also illustrated two Caldecott Honor Books, Sam and Dave Dig a Hole and Extra Yarn, as well as Triangle, all written by Mac Barnett. Jon Klassen lives in Los Angeles. The Wolf, the Duck, and the Mouse…[is] funny, with morbid senses of humor that will hit Halloween sweet spots…It turns out the wolf’s gut harbors the best party in town, and some readers’ sympathies might shift toward the carnivore—aided by the great Jon Klassen’s droll paintings; no one does perturbed animals better. The story’s timeless, fable-like feel is bolstered by its traditional cast and old-fashioned fairy-tale language: “Oh, woe!” cries the wolf. “Oh shame!” Life can turn the tables pretty quickly, Barnett suggests, and only those whose outlooks are flexible will flourish. “I may have been swallowed,” says the duck, “but I have no intention of being eaten.” A rare treasure of a story, the kind that seems to have been around forever. Barnett and Klassen’s collaborations are always good for a laugh, and this one banks heavily on absurdity, to great effect. Klassen’s mixed-media artwork transforms the wolf’s interior into a delightfully domestic scene, and Barnett’s writing is peppered with amusing details. This original pourquoi tale will make a fantastic choice for storytimes, as kids will want to dance along with the duck and mouse—when they’re not rolling in the aisles, of course. Barnett’s shrewd wit and subtle sense of irony come across expertly in short, snappy sentences, while the repeated refrain of “Oh woe!” and the pourquoi-tale ending lend the story a folkloric tone...Reminiscent of classic animal fables, with this winning team’s signature humor and charm, this is a first purchase for any picture book collection. This is a delightfully entertaining mash-up of familiar storytelling tropes combined in a wholly original way. Barnett’s language is both funny and rich...Klassen’s mixed-media illustrations are concentrated down to their essences, with colors so subtle the art appears black- and-white at first glance; striking tableaux that seem to capture each moment at the very peak of the action propel the story forward. Readers will laugh out loud at the cunning duck's skills at getting exactly what he wants from the bemused wolf. Author Mac Barnett and illustrator Jon Klassen—who previously collaborated on Triangle and two Caldecott Honor books, Extra Yarn and Sam and Dave Dig a Hole—are an ideal team for readers who like a little quirk in their picture books. The Wolf, the Duck & the Mouse is, like all Barnett-Klassen collaborations, distinctly funny, imagination-stirring and lovely to look at. It’s a story packed with funny details—from the knives and candles of the duck’s wolf-belly home to the makeshift warrior gear the duck and mouse wear when charging the hunter. The dramatic dialogue is entertaining (there are several utterances of “Oh woe!”). And the amorphous dark shadows of the forest are beguiling in Jon Klassen’s hands...Mac Barnett and Klassen do it again, bringing readers a story they’ll wolf down. Klassen's signature palette, compositions, and comedic, horizontally elongated eyes are here along with the heightened action propelled by Barnett's narrative. Barnett wrestles Aesop and Grimm into pretzels, adding a groaner ending ("And that's why the wolf howls at the moon") for the mustard. A howl. 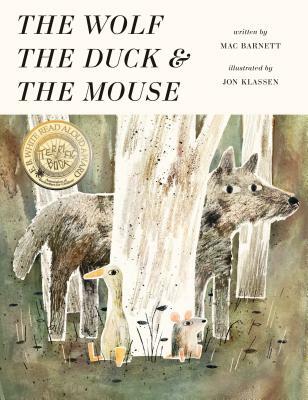 A duck and a mouse are swallowed by a wolf and take up comfortable residence in his stomach...in this madcap twist on a fairy tale from gifted collaborators Mac Barnett and Jon Klassen (creators of "Triangle" and "Sam and Dave Dig a Hole," among others). The storytelling is first-rate. “Wacky” hardly seems adequate to describe this outlandish fable, which is rendered all the more boisterous and fun by Klassen’s illustrations...they’re vibrant and energetic, with the creatures’ starry, dark eyes gleaming with sly intelligence, their postures exuding personality. And who could resist the duck’s oh so quotable assertion: “I may have been swallowed, but I have no intention of being eaten”? Highly recommended. The story is so fantastical and so cleverly written that children will love it. They will want to hear it over and over again. Thanks to its consistent pace, flowing dialogue, catchy one-liners, and ample use of repetition, this title makes for a read aloud that will have young readers on the edge of their seats. This title is a delightful way to introduce anthropomorphism, and teachers may also consider using it to discuss making predictions and inferences. Jon Klassen’s signature illustrations (I Want My Hat Back) and Mac Barnett’s classic sense of humor (Extra Yarn) team up again for this quirky book about a mouse and a duck who are swallowed by a wolf—and throw a party in its belly! Your little woodland creatures will laugh out loud. Read this book. Love this book. Embrace it and discuss it with your kids. Barnett and Klassen do it again.